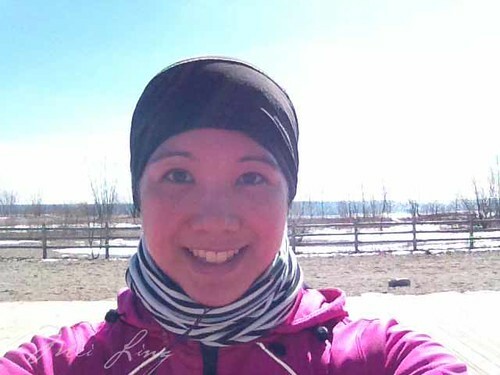 On Sunday I did my last run of the winter because spring is officially here! I can’t even explain how excited I am right now. When I set out on my run the weather was beautiful. It was -22 but there was blue sky, sunshine and no wind. 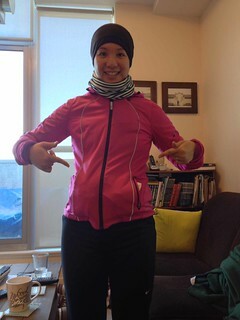 I felt overdressed since I had layered for a -30 run in anticipation of the wind. I decided to carry my Yaktrax in my pockets because I thought that the sidewalks would be clear and the trails would be icy. The weather had also been really up and down with the temperature rising to 8 C and then going back to -30 (including windchill) within a matter of days. Usually when this happens all of the snow melts into giant puddles on the trail and then freezes again. Me with my Yaktrax in my pockets. They were very bulky and I didn’t end up using them. The first half of my run was amazing. There were hardly any people out, which meant nobody to dodge on the sidewalk. I ran along happily enjoying every minute. The boardwalk was clear and it was a beautiful day. Another selfie. I felt so happy. 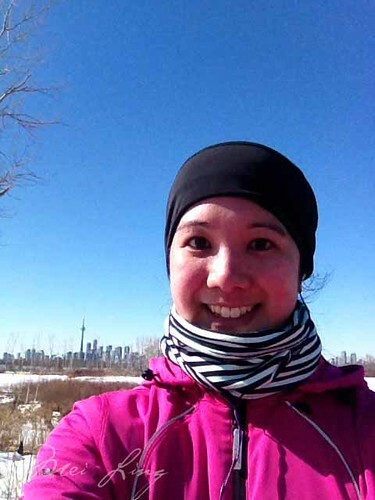 I ran through Tommy Thompson Park where I continued to enjoy the peace and quiet. Things were looking good until I turned around to head back. 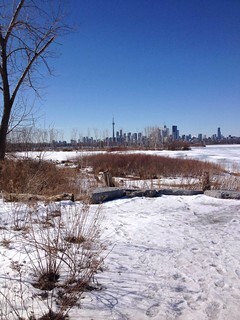 This is one of my favourite views from Tommy Thompson Park. You feel so far away from the city yet you’re still in it. 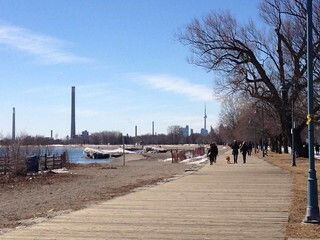 Tommy Thompson Park and I have a love-hate relationship. I love running there but there have been several times where I feel like I barely made it out. In the summer when it’s too hot, I’ve ventured out there only to crawl back out feeling dehydrated and drained. In the winter the wind pounds at you until you can’t feel your body any more. This is what happened to me on Sunday. When I entered the park I ran past a lot of people running out of the park wearing balaclavas. This was a little odd to me because up until this point I’d only seen other runners dressed in light running clothes and even some in shorts. It was only when I turned around that I remembered why you would need a balaclava in Tommy Thompson Park. The wind started pounding at me relentlessly and before I knew it, my water was frozen, my face was frozen and my legs were frozen. Getting back out of the park was pure torture and when I finally made it out, I pulled out my phone and called Dan. “Dan, I’m frozen! Can you pick me up at Starbucks?” I tried to say, but my face was so frozen that my words could barely come out. Dan agreed to come get me and thankfully took me home to the warmth. Now he keeps making fun of my phone call but he says he’s glad I had the sense to call. The total distance for my run that day, which was my last run of the winter, was 22k. Bring on the spring! 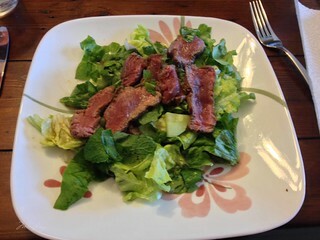 Dan made me this thai beef salad with mint as my recovery meal (he got the recipe from my Runner’s World Cookbook). One of the other things we did over the weekend was see Swan Lake. 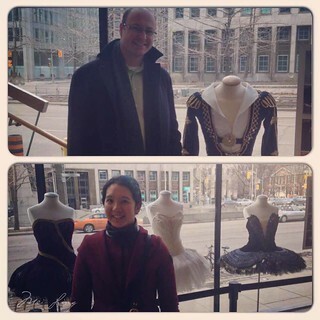 Dan and I at the ballet posing with Siegfried, Odette and Odile’s costumes. When I realized that the dancer playing Odette/Odile was Sonia Rodriguez (Kurt Browning’s wife), Dan and I started trying to find Kurt Browning in the audience. Suddenly every bald man became Kurt Browning in our eyes (Dan is bald so I feel ok saying that). The woman sitting next to me was given the tickets as a gift and couldn’t stop talking about how scared of heights she was. She went on and on and on and her daughter told her to stop because she was scaring her. I felt bad for the woman but at the same time it was a little entertaining. The woman stayed for the whole show and it sounded like she had a good time so I’m glad she stuck it out. I read the synopsis for Swan Lake and realized that the ending wasn’t the same as the 1981 cartoon version that I grew up watching. I’ve decided that the differentiating factor to the ending was the squirrels who helped Odette and Siegfried in the cartoon. Just an observation. 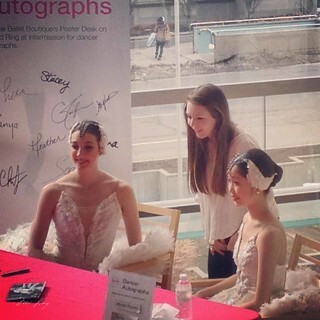 You could line up and get ballerinas to autograph your program and take a picture with them. The line was long so I didn’t do it. I took this picture from the stairs. The ballerinas were beautiful. Other than getting frozen it wasn’t a bad weekend!